For most people, balding is a long and slow process that can occur over many years. It can happen so slowly and gradually that you might miss the early signs of male pattern baldness. Studies reveal that many people can lose as much as half of their hair before they even realize that they are experiencing a thinning. However, the sooner you notice hair loss, the faster you can start hair loss treatments, such as our proven New Bedford laser hair therapy. Do not assume that you simply have the male pattern baldness gene and that there’s nothing you can do about it. Regardless of the type of hair loss you have, South Coast Hair Options can help you get a full head of hair in a way that is individualized to your needs, lifestyle, and budget. 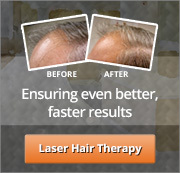 We can solve ALL of your hair loss problems and help you to look your best. If you have other men or women in your family who have thinning hair or baldness issues, start looking in your late teens or early 20s for signs of male pattern baldness. For some men, these signs can begin with a bit of thinning hair at the crown or the temples. However, for other men, the hairline at the front starts to evolve into a V-shape instead of a flat, straight-across line. You might not notice it right away, but you should stay on top of it and check it on a weekly or monthly basis. Compare your hairline to old photos to see if there are any changes. You can even use your smartphone to take a picture of your hair with the same cut and styling so you can monitor for any changes. Make sure to take a photo of the crown or back of your hair as well just in case you experience thinning in those areas. If any of this sounds familiar, come by South Coast Hair Options for a FREE evaluation. We can check your scalp, gather information about you and your family history, and figure out the underlying cause of your hair loss. This is the best way to determine the proper hair loss treatments based on your specific needs. There is no one-size-fits-all treatment that works on all types of hair loss. If you have the male pattern baldness gene, you will have different requirements for someone who experienced hair loss due to prescription medication side-effects or stress-related issues. While our New Bedford laser hair therapy has proven to be effective with both men and women, it might not be the best course of action for you. Our team of highly trained and experienced technicians will consider your early signs of male pattern baldness to come up with a custom treatment program that will address all of your needs. Our Corrective Hair Solutions (CHS) approach is affordable, safe and natural, and won’t restrict your active lifestyle. Each treatment option we provide is individualized to the needs of each client and will work with your existing hair. Our treatments are completely natural looking, whether you are able to re-grow hair with our hair loss treatments or require more instant results, such as our Virtual Reality non-surgical derma lens solutions. We can help you restore your youthful appearance while matching your natural hair color, curl pattern, texture, and density for virtually maintenance-free results. Why is Corrective Hair Solutions (CHS) Different? Compared to other hair loss treatments, such as programs you’ve likely seen on television or read about in men’s magazines, our Corrective Hair Solutions approach at South Coast Hair Options is totally different. We are unique because every solution that we provide to our clients is tailored to their individual needs. 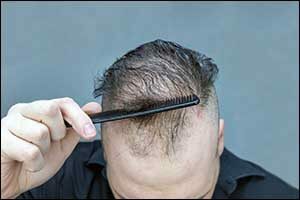 The treatment for someone with the male pattern baldness gene will be quite different than the methods used for someone who has stress-induced hair loss. It is essential to find the root cause of hair loss before offering hair loss treatments. To find out if our New Bedford laser hair therapy or other products and solutions are right for you, make sure to stop by our location on Acushnet Avenue or give us a call at 508-995-7085. We can offer a FREE consultation and scalp evaluation to help get you started and help you stop those signs of male pattern baldness from getting any worse. Call or stop by today, so you can start looking and feeling like yourself again!